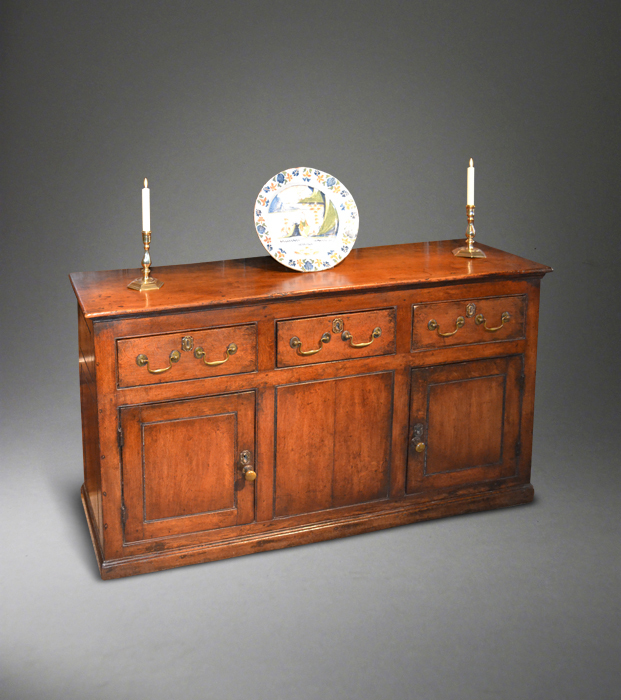 Suffolk House Antiques | A small George III West Country dresser base. A SMALL GEORGE III WEST COUNTRY DRESSER BASE. A small George III West Country dresser base of narrow proportions with a superbly figured one-piece elm top above three drawers and two panelled cupboard doors in oak. Plinth base, panelled sides and with a boarded back. Unusually the handles, escutcheons and hinges are original. Excellent honey colour. Circa 1790. 55 1/2 inches wide x just 16 inches deep x 33 inches high. the price is £3450.